This app allows you to share files with your friends. 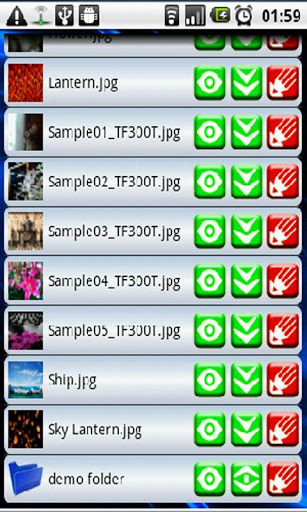 You can set permissions(view, upload, download, edit) to each file or folder you want to share. Your friends or you can download, upload, copy, move, delete, rename files and folders from remote device or from browsers! Also you can watch video and listen to music remotely! And if you like it - download it! Even if you don't have WiFi-router, you can create portable WiFi hotspot, connect to it and enjoy viewing files! Do everything with files if permissions allow it! -Fully functional local and remote file browsers! 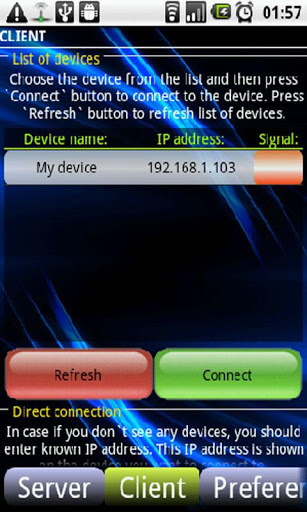 apps - WiFi File Sharing | WiFi File Sharing Demo | Connection State Viewer | Screen & WiFi Holder | AllCredit | Remote Manager | Remote Manager Demo | WiFi File Sharing Galaxy Ed.